These homemade strawberry ice cream recipes are among the best ever published. You'll love trying them at your house! There's nothing like the fresh taste of homemade ice cream when it's flavored with freshly picked strawberries. 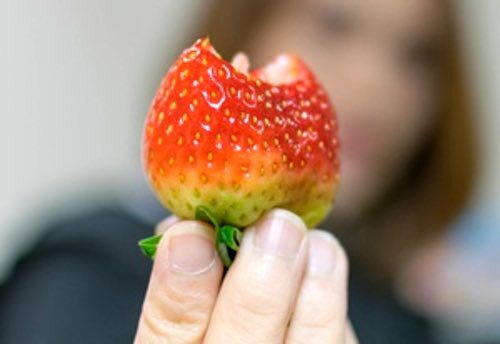 Ever since ice cream was first invented, strawberries have been a popular flavoring ingredient. And, thanks to Dolley Madison (see below), strawberry is the flavor that helped popularize ice cream as a fashionable dessert in North America. We ice cream lovers owe her a huge debt of gratitude. As the "Widow Bedott," of Nettleton, Mo., gives one to the Blade, which is perfectly plain, I will give it first. She says: "Rub 1 pint of ripe strawberries through a sieve, add 1 quart of cream, 3/4 lb of white sugar and freeze." Fruit frozen with custard may not be particularly good for the digestion, but as it is a popular dish, it is well to know how to insure success when preparing it. Take 1 quart of milk and 1 quart of cream, 6 eggs, 3 cups of sugar. It is a good plan when making any custard to beat the yolks of the eggs and the sugar together; then all the lumps can be crushed without difficulty and there is less danger of the eggs looking stringy. To this quantity of custard, one large pint of ripe berries, or peaches cut in small pieces, is the due allowance. To my taste, 1 quart is not too many. Heat the milk and cream, then add slowly the sugar and eggs. Cook it in a farina kettle (double boiler), or in a pail set in a pan of water. When thick, take from the fire, remembering that it will be a good deal thicker when it is cold. When cold, stir in the fruit, and freeze as you do any ice cream. Remarks. —This was published in the London Free Press (Ont. ), sent me by my daughter, Mrs. D. Mills, living there, and I will vouch for it, and support the writer in the use of the quart instead of a pint of the berries. This easy recipe for strawberry ice cream requires no beating at all and can be made in your refrigerator freezer. We made this frozen dessert often when I was growing up on the farm. 1 quart strawberries, 3/4 cup sugar, 1 teaspoon vanilla, pinch of salt, 1 cup Evaporated Milk, 1/2 cup condensed milk or 2 cups whipping cream. Wash and stem the berries. Add sugar and heat to boiling. Remove from fire and run through a sieve. Add salt and allow this berry mixture to cool. Add the condensed milk. Add vanilla. Pour into freezing tray and allow to freeze without agitating. If fresh cream is used, fold in two cups of whipped cream to the above berry mixture. More sugar can be added if necessary. Add vanilla, and pour into freezing tray, stirring with a spoon from front to back of tray once during the freezing process. Makes eight servings. 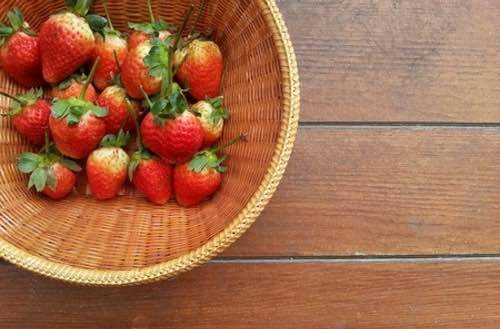 Reduce one quart of strawberries to a pulp. Do this with a potato masher in a large porcelain bowl. Stir into this gradually one pound of pulverized sugar, then stir in three pints of cream, and freeze. Serve in small nests of spun sugar, or fill the cream in eggs made of meringue, and lay one in each nest. The effect is very pretty. Cherry Ice may be served instead of the cream, or both. Of course, this is meant for company only. 1 lb fresh strawberries, 2 eggs, 3 gills milk, 3 gills cream, 6 ounces sugar, a few drops of carmine. Sprinkle the strawberries with the sugar and allow them to stand a little while, then rub them through a hair sieve. Make custard of eggs and milk, and when cold, mix with the whipped cream and puree of strawberries. Put all into the charged ice cream freezer and freeze dry. This old fashioned method requires some considerable preparation, but I am sure you will find that the taste of the ice cream is well worth the effort. Sprinkle 2 cups of sugar over 2 quarts of strawberries; mash them and let them stand 1/2 hour or until the sugar is dissolved. Meanwhile, prepare the ice and pack the freezer; turn the berries into a large square of cheesecloth which has been placed over a bowl; gather up the edges of the cloth, twist them, and squeeze as long as any juice or pulp will come; then empty the pulp and seeds left in the cloth into a pan, and pour on gradually about 1 pint of milk, and mix it well with the pulp until the pulp is separated from the seeds; squeeze again until perfectly dry. There should be nothing left in the cloth save a ball of seeds. The pulp will thicken the milk, and it is much nicer than the juice alone. Add to this pulpy juice as much cream as you may have, from 1 cup to 3 pints, and sugar to make it very sweet. The cream should be scalded and cooled. Freeze as usual. This is delicious and a great improvement over that made by simply mashing the fruit, where the presence of the seeds is objectionable. Make other berry ice cream in the same manner. This is an easy kid's recipe for ice cream, and it's especially rich and delicious when made with confectioner's sugar. Hull a pound of ripe strawberries; sprinkle a quarter of a pound of powdered sugar over them, and rub them through a sieve. Mix with the puree its measure of cream, whipped; and freeze. This simple strawberry ice cream recipe might be similar to the one used by First Lady Dolley Madison's White House chef. It's very easy to make. Mix a cupful of sugar with a quart of ripe strawberries, let them stand half a day, then mash and strain them through a coarse towel, then add to the juice a full cupful of sugar and when dissolved, beat in a quart of fresh thick cream and freeze. Raspberries, pineapple and other fruits made the same. 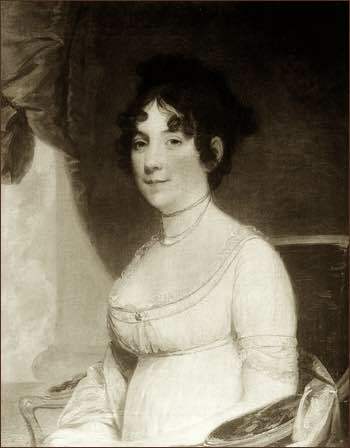 Dolley Payne Todd Madison (1768-1849), the wife of President James Madison (1751–1836) and the "first" First Lady of the United States, became famous for her lavish balls and parties. Dolley (widely misspelled as "Dolly") often served elaborately molded ice creams at White House receptions while acting as hostess for the widowed Thomas Jefferson and later as hostess during her husband's presidency. Dolley is credited for making ice cream a fashionable dessert after she ventured to serve a "shimmering tower" of pink strawberry ice cream on a large silver platter at President James Madison's second Inaugural Ball in 1812. The trendsetting dessert was prepared by White House Chef Augustus Jackson using fresh cream from the Madison's dairy at Montpelier and freshly picked strawberries from Dolley's own White House garden. Soon, fancy ice creams and molded strawberry ices were being served at fashionable events in all the major cities across the land. 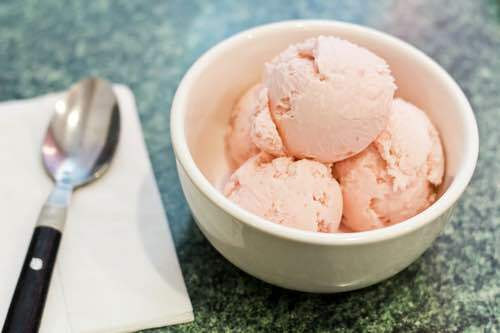 Now, you can follow in the tradition of Dolley Madison and use the homemade strawberry ice cream recipes above to create your own frozen creations. Nothing beats the taste of ice cream made with fresh strawberries in season.